Mike Vanderboegh has said on many occasions, that there are times, particularly when targeted by the ATF, that all you can hope for is an unfair gunfight, because the deck is so obviously stacked against peaceable citizens. Not me. And as is often pointed out, if there is no rule of law, that works both ways. If I have none of the protections that are recognized and codified in the US Constitution, then any jackbooted thug that comes to my door to cart me off to an international court will also have no protection of the rule of law. Um. I mean, Uzis. Yup, I’m the proud owner of two new Uzis. Yes, they are real. Straight from Amazon.com, with no background check whatsoever, delivered straight to my door. Yes! 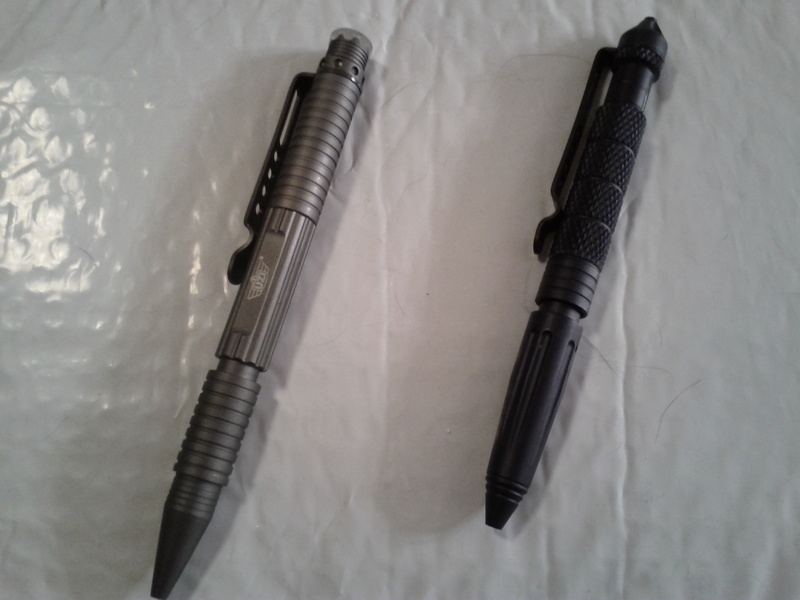 The black one has a glass breaker and the gun-metal one has a “DNA collector.” They were my first purchases with my trial Amazon Prime membership (which I believe could be my financial undoing — it’s just too easy to click my bank account down to zero before the next paycheck). The black one with the glass breaker is here and the gun-metal one with the DNA collector is here. Don’t know why I got two, but I guess it’s that whole “1 is 0, 2 is 1” thing. They seem sturdy, and write well (nice gel pens that you can easily get refills for). It’s a bit hard to find something to test the glass breaker on, because, you know, I kind of value my car windows. The DNA collector would definitely collect some serious DNA if you had nothing else on you to defend yourself. Like my 1 inch stainless steel balls, these pens, for the most part, pass as something innocuous. The SS balls are simply exercise balls, but could easily put a couple nasty dents in an assailant’s forehead. These are simply writing implements until called upon for more serious work. Sorry, there. Had an attack of the Bradys. Walked into Starbucks. Bought coffee. Had polite conversation with barista. 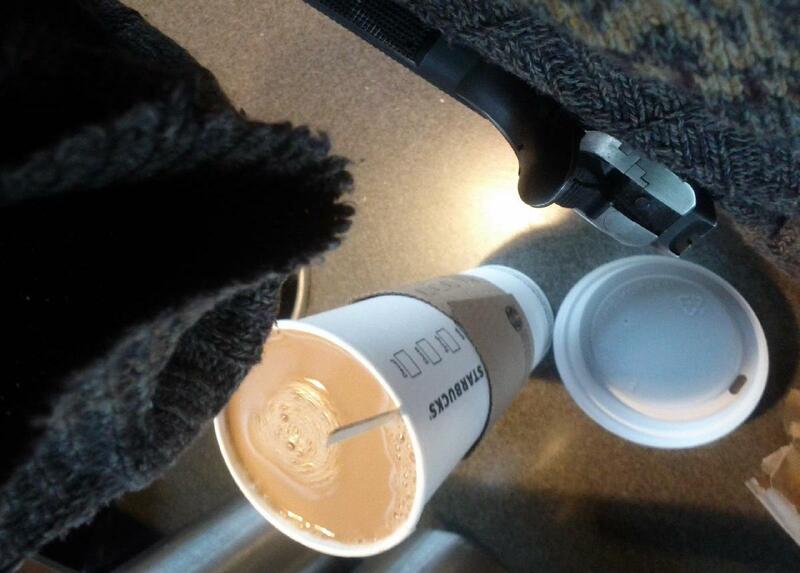 Put half and half and sugar in coffee. Took picture. No one was hurt. No one ran out of the place screaming. Actually, I don’t think anyone even noticed, which is the way it usually is. And it wasn’t my intent to draw attention to it, either. Not even for the sake of the buycott. This is to participate in offsetting, likely by at least a 10-fold ratio, any potential (unlikely) negative affect the anti-human-rights crowd’s boycott may have. We outnumber them. By large margins. A vigil for gun violence victims? We’ll participate, but for ALL victims of violence and encourage the survivors and others to end their victimhood by going armed. Twitter an anti-human-rights rally? We’ll drown you out simply by our sheer numbers. Sure, you have a right to speak, but you are in the infinitesimal minority, and we intend to show you that. Update 2: Also, I heard that the Brady Campaign itself is not actually participating in this boycott, though I don’t have a reference. Apparently, they are learning, and methinks there is a little bit of infighting in the anti-human-rights universe.